The Ahwahnee hotel in Yosemite National Park. 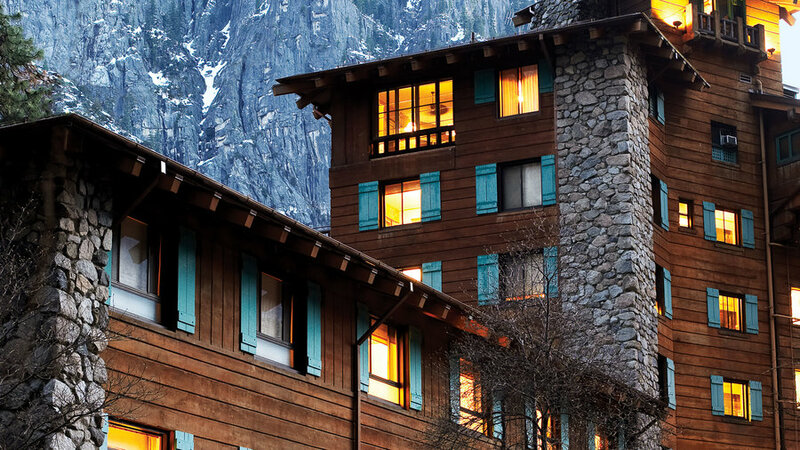 From grand hotel to simple motel, our list of Yosemite accommodations fits every style. All lodgings within Yosemite are handled by the park concessionaire, Yosemite Hospitality. Reservations for all can be made by calling 888/304-8863 or visiting . The Majestic Yosemite Hotel. Formerly known as the Ahwahnee, this grand, 90-year-old hotel is by far the poshest (and most expensive) lodging in the park. 123 rooms. $$$$. Half Dome Village. The former Curry Village provides rustic lodging in Yosemite Valley: simple motel rooms, cabins and tent cabins, some with bath, some without. 498 units; $$. Housekeeping Camp. In Yosemite Valley, one step up from camping: inexpensive concrete and canvas lodging; they supply bunks but you supply the linens. 266 units. $$. Tuolumne Meadows Lodge. Simple cabins (no electricity) gathered around a central dining tent. Summer only. 69 cabins. $$. White Wolf Lodge. Off Tioga Road, 4 cabins with bath, 24 tent cabins without. $$. BIg Trees Lodge (a.k.a. the Wawona Hotel). With its beautiful 19th-century decor, lack of TVs and phones, and perch above Wawona Meadow, it is a worthy alternative, and easier to book. It has small rooms, but a quiet, pretty setting. 104 rooms; $$-$$$. Yosemite Valley Lodge. Modern, motel-style lodge, conveniently located; its Mountain Room restaurant is good. 245 rooms. $$$. Best Western Plus Yosemite Gateway Inn. 122 rooms; $$$. 800/545-5462. .
Yosemite View Lodge. Large modern motel near the park’s west entrance. 336 units; $$–$$$. 209/379-2681. Tenaya Lodge at Yosemite. Attractive modern hotel near the park’s southern entrance. 302 units; $$$$. ; 1-888/514-2167. The Evergreen Lodge at Yosemite. Cluster of historic cabins now nicely restored; adjacent tavern and restaurant. 88 cabins; $$$–$$$$. ; 209/379-2606. The Groveland Hotel at Yosemite National Park. On Groveland’s attractive Main Street, this historic hotel (portions date back to 1849) is nicely spruced up. Breakfast included. 17 rooms; $$$. ; 800/273-3314. Best Western Yosemite Way Station. 78 rooms; $$$. ; 209/966-7545.